Matt and I celebrated our Eighth Anniversary yesterday. It's hard to believe we've been married that long, and at the same time, that it's only been eight years. Although, we dated for five before that, so really we're at a bakers dozen. Anyway, for our anniversary, I bought us each a little something. Matt got the burgundy one, mine's black. 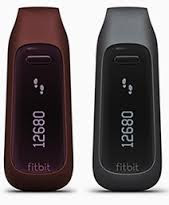 FitBits - they're basically souped up pedometers that give you constant feedback. I'm already in love with mine. Why? Because I love data, hate paperwork. And as my Weight Watcher leader keeps telling us, tracking is the only way to lose weight. She's right, and I know this - but I love my cheerful oblivion. That ends here. And now. I've walked 775 steps, burned 815 calories, consumed 250 calories and drank 64 ounces of water. Last night I slept 7 hours and 53 minutes. I was restless for 8 minutes.